The last time I spent Thanksgiving with any of my siblings was four years ago, a couple of weeks before my mother died. We’d come to spend a final Thanksgiving with her, but she was too sick and too weak to join us. Still she was glad we came. She always wanted her children to be close, and she worried that after her death, we would drift apart. Now here I am, in her house, and she is not here. She’s just one of the guests who can’t come because of cosmic impossibilities. My next youngest sibling died the year before she did, and her grief at his dying helped bring on her own death. And then there’s my life mate. I doubt he would have come (he couldn’t the last time because of his own illness), but it saddens me that he doesn’t have the choice. Makes me even sadder that after the holiday, I won’t be going home to him. 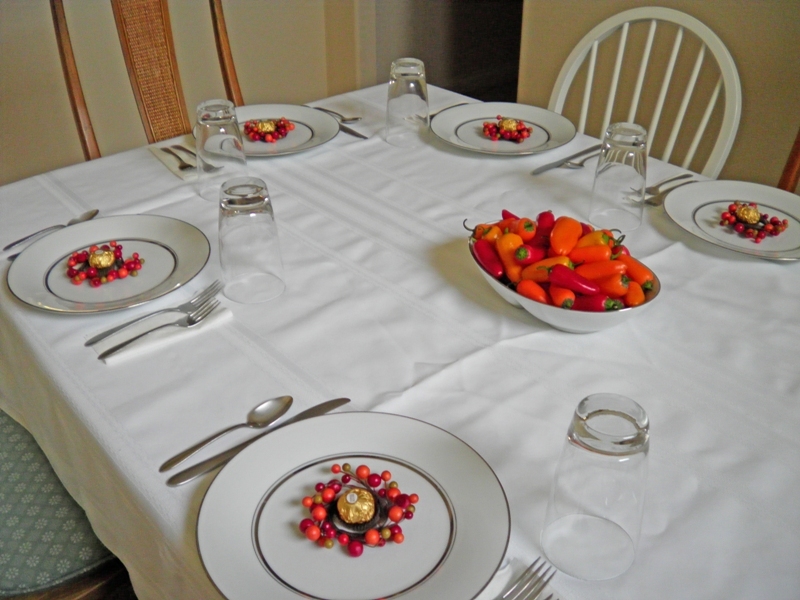 I set the table today to lessen tomorrow’s commotion, and I used my mother’s china. (Sorry, BBB. Paper plates just won’t cut it!! And yes, I will do the dishes.) I want the day to be special because how many more Thanksgivings can my father have? And if he’s blessed with a dozen more, who knows whether even my brother’s vast negotiating skills will gain such concessions again. And it pleased me to be able to do this small thing. Afterward, I was overcome with a burst of grief (to be honest, it wasn’t so much grief as plain old feeling sorry for myself.) My brothers will be at dinner with their mates, and I won’t be with mine. Still, I had him for all those years, and for that, I am truly grateful. I’m not doing the cooking. Each guest is bringing something. I just cooked some turkey pieces. (Not a whole turkey since the oven is on the blink.) Thank you for thinking of me, Deb. Best wishes for a happy Thanksgiving! Mom is 93 this year. She has heart trouble, Breast Cancer and Alzheimer so I don’t know what to expect next year. I’d love to take her somewhere by train after the holidays – just to give her a little vacation. Have a great day, hon. That would be wonderful if you could go on one last trip with your mother! Sounds challenging, but a great memory maker. Pat…sad but beautiful…love the way you write and the person it reflects. Enjoy your day…there will be sadness but also gratefulness…thats life hey. Leesa, I like seeing myself through your eyes. Thank you, as always. Is it just me, or are you having a hard time finding things to be thankful for? Hi, Holly. Thank you for remembering me. And no, it isn’t just you. Last year I was relentlessly determined to be thankful, but this year I don’t even care. That, of course, is all part of the second year limbo. We’ll get through this year, but unfortunately, what awaits us is year number three, and I have no idea what challenges that year will bring. Probably more of the same. Thank you, Rebecca. I hope you had a happy day. Very poignant put. Made me teary because there are empty chairs at our table too, never to be filled. Sometimes the hole their lives have left seems deeper than normal. Painfully noticeable. You’re in my thoughts, Pat. As you are in mine, Joylene. You remind to be patient with myself, that grief lasts a long time. I wish it weren’t so. Actually, what I wish is that we didn’t have occasion for grief. Just got back from our family feast and thought about you with your family, Pat. I hope it went well, in spite of everything. We missed our loved ones today – two of them. A few tears, but a memorial for both of them on tables made us feel that we recognized their absence in a physical way. Wish we could have left an empty chair for them just this once but we were much too congested. It would have been too hard anyway. Just want to reiterate something I learned a few years ago – not as a religious symbol, but just as a conscious thought, lighting a special candle bought especially for your missing loved one can emanate a lot of comfort. Happy Thanksgiving to all, and God bless. We had a lovely day, Deb. Thank you for thinking of me. How nice that you had a memorial on your table. Our only memorial was a toast to my mother.